Bhubaneswar: The ICAR-Central Institute of Freshwater Aquaculture observed the 18th National Fish Farmers’ Day at its Kausalyaganga campus here on 10th July 2018. The day is commemorated in remembrance of scientists Dr K H Alikunhi and Dr. H.L. Chaudhury who had invented induced breeding technology on this day way back in 1957. Addressing the gathering, ICAR-CIFA Director (Acting) Dr. B R Pillai said the invention is hailed as a landmark achievement in the history of fisheries in India and abroad. During the last 3 decades of devoted research, the institute has contributed significantly toward development for breeding and culture of economically important fish and shellfish, use of plastics in aquaculture like FRP portable hatchery, feeds for different life stages of fish, disease diagnostics kits, improved rohu Jayanti, CIFABROODTM and other useful technologies for the farmers. The Institute has been providing technical back up to fisheries department of different states of the country including NEH and NGOs and entrepreneurs as per needs of the organizations. It is also implementing several flag ship schemes of the Government- Swachh Bharat Aviyan, Krishi Kalyan Aviyan, Farmer FIRST, Mera Gaon Mera Gaurav, Digital transaction, Jai Kisan Jai Vigyan, Soil Health Card , Schedule Tribe Component etc. Prof. P K Mishra, Chancellor, Dr Rajendra Prasad Central Agricultural University, Pusa, Samastipur, Bihar was the Chief Guest on this occasion. He suggested studying and combining traditional wisdom and modern technology in fish farming. He congratulated the Scientists for making fish breeding so easy to adopt and practice. He suggested using sensor and IT tools to know the number of fishes in big ponds and lakes as well as to study fish behaviour. He suggested collaborative research of fish biologists and informatics scientists in order to develop improved technology. He urged to work on water body retention policy. He suggested the name of the fish should be in Sanskrit language. Dr. N Sarangi, former Director, ICAR-CIFA was Guest of Honour on this occasion. He spoke about multiple breeding, off-season breeding, bigger fingerling production and other technological advancements made in the field of freshwater aquaculture. He described how Scientists made induced breeding easier and how this has contributed to India becoming second largest fish producer in the world. Government is promoting fish farming under Blue Revolution in a big way. He urged unemployed rural youth to come forward and take up fish farming as a business venture. Dr. S D Gupta, Former Principal Scientist, ICAR-CIFA graced the occasion as a special guest. He shared his experience of working with Dr. H. L. Chaudhary in Cuttack station and his 40 years of journey as fishery scientist. He also spoke about Composite Fish Culture and how it got a boost from induced breeding. He also focused on the problems of water scarcity and gave the idea for water harvesting. He expressed happiness that many young entrepreneurs are taking up fishery related business. 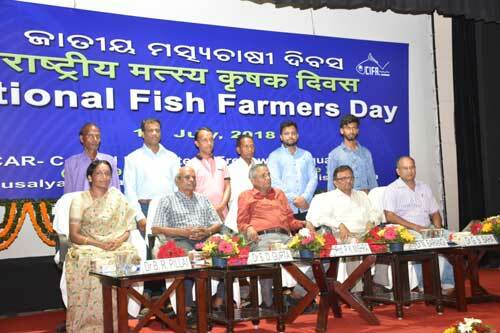 Around 90 fish farmers from Odisha and other parts of the country were present at the event. Six fish farmers from different parts of India were felicitated for their contributions to the development of freshwater aquaculture. The awardees are Bhabendra Mohanta, Mayurbhanj, Odisha; Umashankar Thakur, Kalahandi, Odisha; Sk. Saddam Ali, North 24 parganas, West Bengal; Apachha Das, Puri, Odisha; Ashok Kumar Nayak, Cuttack, Odisha and Kalinga Marine Exports, Bhubaneswar. The awardees also shared their experience in fish farming with the audience. A scientist-farmer interaction session was also organized on the theme ‘doubling farmer’s income’which was moderated by Dr S C Rath, Principal Scientist . Dr. G S Saha, SIC, Social Science Section, proposed the vote of thanks. 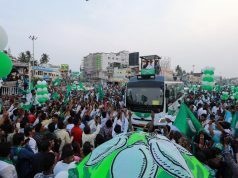 The day is also being celebrated in five regional stations located at Anand, Gujarat; Bhatinda, Punjab; Bengaluru, Karnataka; Rahara, West Bengal and Vijayawada, Andhra Pradesh.